Read more "Call For Entries: Swede Fest X"
And just like that another Swede Fest has past us and this one was one for the record books. Not only did we continue with our tradition of breaking attendance records (we had about 320 people in the house) with every subsequent festival, due to the size of the theater we unfortunately had to turn people away. The theater management probably let more people than should have been in there (as displayed by the amount of people willing to sit on the ground and stairs) and it pained us to have to turn people away (for those people, our heartfelt apologies) but nobody could have predicted the kind of turnout we had. Not only did Swede Fest 9 receive entries from around the Central Valley, we also had our most international entries we had ever hosted with films from filmmakers in Hungary, Germany & the U.K. Weren’t able to make it? Well you can catch all the films online over here. Big thanks to Gotta Love Fresno for sponsoring our event, Kirk James for designing our flyer but most of all EVERYONE who participated & submitted an entry. This festival would be nothing without all your hard work and effort. Keep up the good work! Now’s it’s over, we’re already starting to plan the first DOUBLE DIGITS Swede Fest coming in November of this year so now the perfect time to start planning YOUR entry for the next one. Remember, you’ll love this movie because you’re in it! See you guys around and be sure to follow us on Twitter & Facebook to get all the latest news, check out exclusive pics and more. See you guys soon! 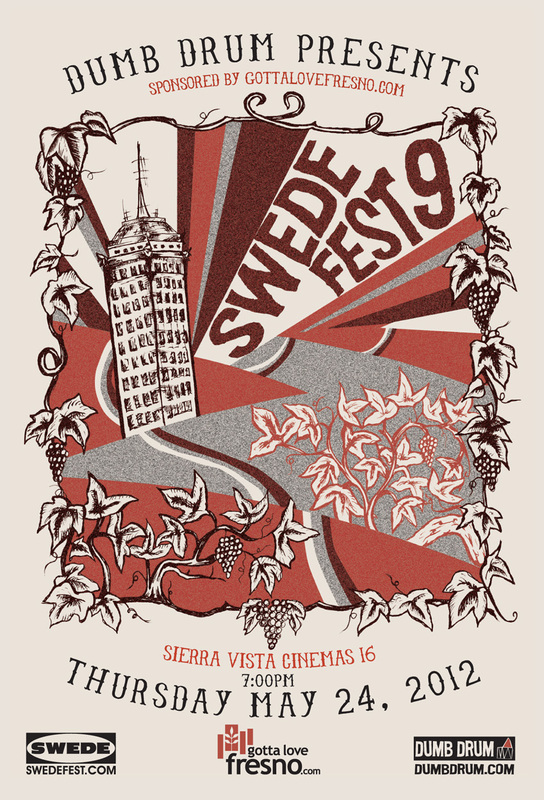 Read more "Swede Fest 9 wrap-up"
As the date draws closer, we wanted to remind you all that you still ave plenty of time to produce your entry for Swede Fest 9, which goes down Thursday, May 24th at 7pm. The deadline to enter is still May 20th so get cracking, you still got time just get the team together and start creating! We also want to take this chance to premier our poster design for the festival and if you have eyeballs, you can see it up there. Designed by Kirk James, it continues our tradition of getting fresh designers working on our promotional materials. Keep an eye around town for the flyers and be sure to help spread the word on the festival. We will be announcing more cool stuff leading up to the event (including pre & after party plans) but in the mean time, just concentrate on making an entry. Thursday, May 24th is going to be AWESOME! Read more "We need your entries!